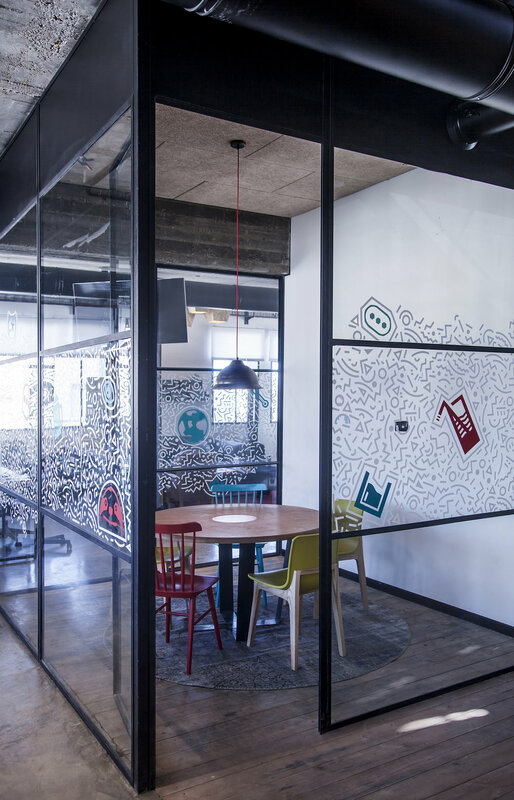 Roy David Studio was commissioned by hi-tech companies Apester and CoCyles to design a 500 sqm unconventional office space in the heart of Tel Aviv. The office space covers two stories and it is situated inside a newly renovated building proposed by the studio as a high-tech business hub. The firms were searching for a design that would be characterized as being youthful, innovative and one that has an overall coherent style. The general concept of the intervention was to design an office that can shelter both public and private spaces connected by a fluid and intuitive circulation. Thus, the main area plan was divided into equal working spaces for the employees with common public area situated in the center of the floor-plan. The overall interior arrangement proposed by the designer is responding actively to the needs of its users allowing the companies to do both open spaced team brainstorming as well as individual, more private work. The division between the 2 companies is done with the use of a series of custom designed furniture elements acting as dynamic visual barriers. The first floor of the intervention is designed as an open space with the public functions such as conference rooms, cafeteria and the resting spaces situated at its center. Sprawling and in perfect sync with the central public space are wide working stations designed for the employees of the firms. A more detailed view on the public space would show 2 conference rooms located at the center of the space allowing two types of gatherings, the large conference room one for about 12 participants and another small conference room for more informal meeting panels for up to 6 participants. To create private boardrooms without impairing the sense of continuity, branded textures were used on the glass surfaces bounding the public spaces. 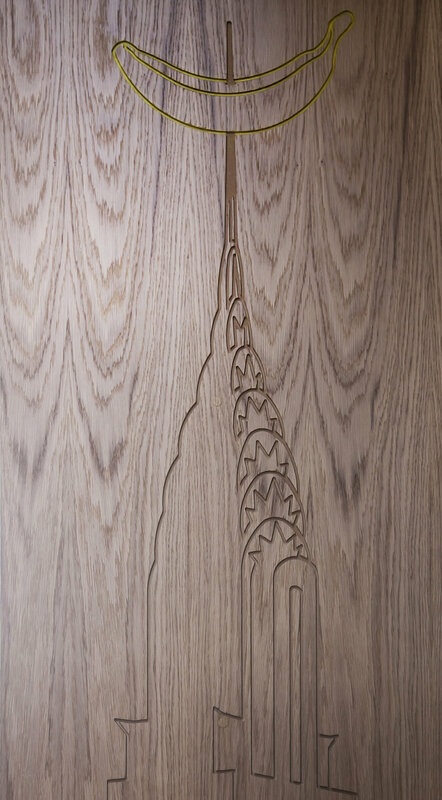 Movement and rhythm is added to the design with the use of dynamic wooden boards with one side painted and the over having a chalkboard texture. The wooden boards act as another visually blocking material between the recreational space and the rest of the office areas. From the architect: "I approached the artists, Eyal Eliezer and Elna with the idea to bring color to the seating areas for both companies. We wanted to create an atmosphere that may inspire and engender bright ideas. 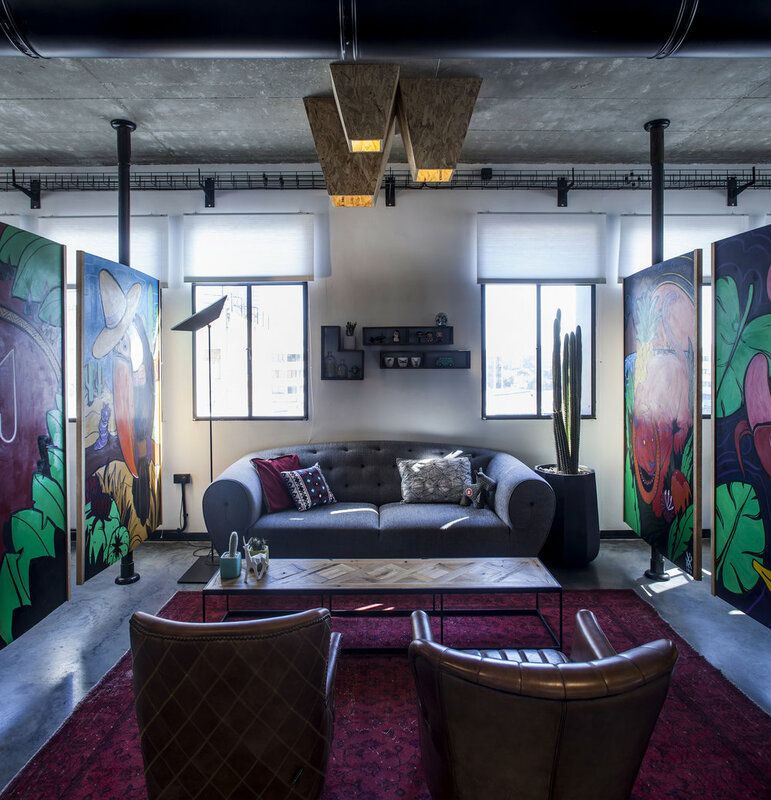 Eyal designed a composition of six huge paintings on the coulisse, drawing his inspiration from the companies branding strategy along with psychedelic street art. Elna was appointed to handle the big plaster walls at the entrance of the space, adding a shot of color which creates a pleasant and welcoming atmosphere for one sitting there." The connection with the upper floor is done with the use of a pedantic designed industrial staircase made of natural iron and expanded net. The materials were specially chosen in order to accentuate an architectural discourse dictated by industrial and lo-fi design elements. The iconic staircase leads to the patio where one can find the kitchen and bar, accompanied with an outdoor seating area perfect for taking a break and enjoying panoramic views of downtown Tel Aviv. All around the two new office floors, overlooking the urban landscape, the studio carefully placed a shading system with UV filters allowing the users to control the amount of light entering the space. The lighting fixtures that are placed around the office space are designed with the help of industrial designer, Haim Ivgi. The shared collections of the two designers is about to be presented for sale in different places around the world. We understand that office design has become an indispensable tool for recruitment and retention of excellent employees. The Israeli competitive hi-tech world leaves no room for conventional design. As high-tech companies contact our studio, it is because they are looking for staff who speak the same language as they are, always meets the customer’s needs, and can withstand short time schedules, similar to what they are used to work under. "The design language reflects the company believes that strive for creativity and excellence. We want to transcend a design without boundaries that not only brightens ones day but determines the user to want/choose to stay there."